A sparkling hanging ornament with pretty blue lace agate raindrops. Inspired by gentle summer rainfall, when the sun shines through each droplet reflecting shimmering watery tones. 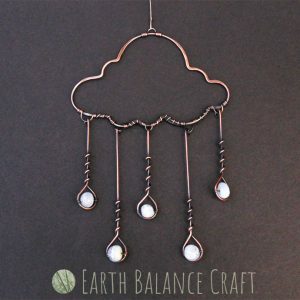 This copper wire work design is kinetic with droplets that hang from the cloud frame and gently swing with movement. This remembrance gift symbolises the spirit of those who have passed with a white butterfly, a reminder they are there offering protection and guidance to you. Hang in your window or your car in memory of your loved ones. This pretty copper wire-work, gemstone and glass hanging decoration is inspired by the British species called the ‘Wood White’ butterfly. Typically found in shaded damp woodland and are striking in appearance with grey white wings. This sparkly crystal window decorations features a single falling rain droplet with watery gemstones and glass. 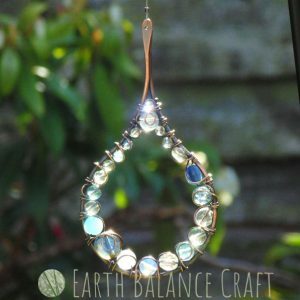 This suncatcher can be hung in a sunny spot for pretty flashes of light as it plays with the beads, or out in the garden for year round sparkles. Inspired by summer rain drops with translucent rainbow colours, from watery greens to vibrant blues. A botanical red apple fruit decoration made with swirls of copper wire and adorned with vibrant gemstones and glass. The design follows the beautiful contours of a single apple and is topped with two apple leaves. Hang in your kitchen window for flashes of citrus sunlight, the perfect summer-time sun catcher. The perfect gift for bird watchers and twitchers. This pretty hanging decoration pays homage to the little garden birds that sit together on a tree branch. The design is hand-made with copper wire work and green Czech glass beads. Hang as wall art in the home or in your window where the translucent beads will sparkle when back-lit by sunshine. 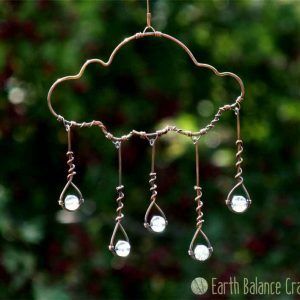 A kinetic decoration with dangling rain droplets that gently swing with movement. Making the perfect weather gift for the home. Hand-made with delicate wire work and five shimmering blue rain drops that are falling to the ground below. This pretty metal decoration loves to be hung in a sunny window for year round crystal sparkles. Sharing our passion of the great British weather! A hand crafted decorative copper wire dragonfly with labradorite, peridot, agate, fluorite, quartz and glass beads. Inspired by the buzzing sounds of summer river walks, with the delicate Willow Emerald dragonfly, one of my favourite British species. This whimsical style suncatcher can be hung in the home or garden as a pretty decoration, coming to life in the sunshine. A framed oak leaf design with copper and glass. This little piece of wall art is inspired by a rainy woodland scene featuring the British oak tree with tiny droplets of rain water rolling of the classical oak leaf shapes and a single acorn. Designer Nicola has a love for magnificent oak trees, rich in tradition and tree lore, a British tree that endures for hundreds even thousands of years with grace and calm. This piece combines the iridescent colours reflected in the glass beads with dappled shades of polished weathered copper. Suitable for hanging in the home and garden. A decorative hanging decoration following the contours of a single woodland mushroom. The design is handmade with copper wire work and adorned with gemstones and glass. For walls, windows and outdoors in the garden, celebrating the world of fungi! 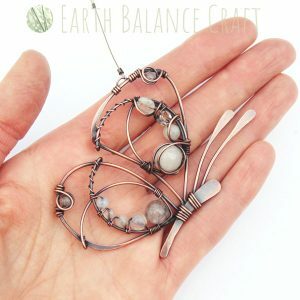 A single copper wire icicle hanging decoration adorned with agate, quartz, seaglass and Czech glass beads. This pretty window sun catcher loves to live in a sunny spot so she can sparkle! She also loves a yule fir tree and is happy being friends with fairy lights. The wintry droplet features a cool colour palette of ice blues, aqua, white and shimmering translucence. Celebrate the depth of winter with these icy creations that bring a smile to your home and garden. A botanical lemon hanging decoration, hand-made with copper wire work and adorned with zesty gemstones and glass. The design follows the familiar contours of a single slice of lemon, with a pretty outline of the segments and topped with lemon leaves. Hang in your kitchen window for flashes of citrus sunlight, the perfect summer-time ornament.